By Jake Rocheleau in Web Design. Updated on October 9, 2018 . But it also works on smaller blogs and even blog posts you find on Medium. It’s a pretty simple browser plugin that searches each page for <pre> tags. Then it adds the click-to-copy button onto that section which lets you auto-copy the full code right to your clipboard. You could not ask for a simpler way of gathering snippets and working them into your projects. Since this thing works for 3 huge browsers it should provide support for the majority of developers. I don’t know any developers who exclusively use Microsoft Edge or Safari. So with support for Chrome and Firefox(plus Opera), this extension should cover 99% of the dev community. 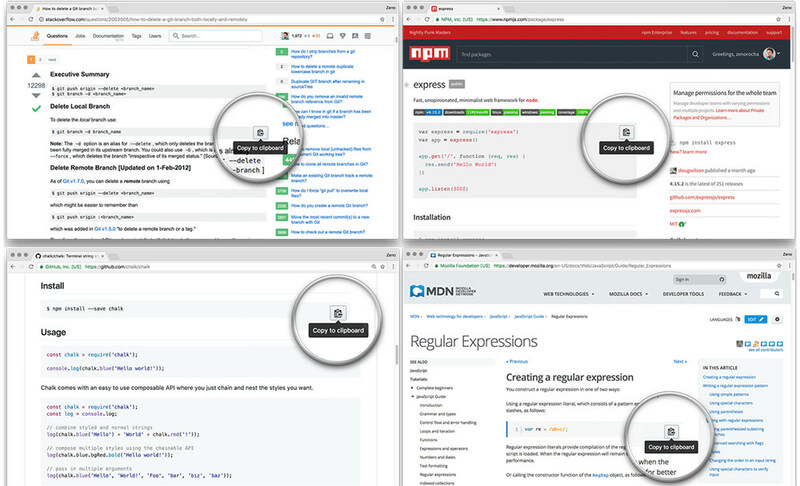 Have a look at the GitHub repo to learn more and to download the extension files. This must be installed manually but it only takes a few steps to get it going, and these install steps are organized neatly at the bottom of the GitHub page.